The 777-200 is a long-range wide body twinjet with a seating capacity of 305-328 passengers in three classes. The 777-200ER (Extended Range) has a range of 7,730 nautical miles (14,316 km) compared to 5,210 nautical miles (9,649 km) of the standard 777-200. The 777 is among the most advanced jetliners in production today, featuring fly-by-wire technology and digitally controlled engines, offering passengers an unmatched level of comfort and travel speed. It was also the first jetliner to be entirely designed using three-dimensional computer graphics. 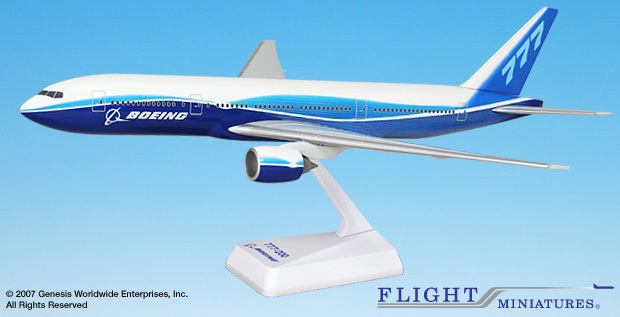 In July 2004 Boeing introduced a new corporate livery for their demo colors, the fifth standard commercial airplane livery in the company’s history. The new livery was developed from the concept livery used for marketing the all-new Boeing 7E7 Dream Liner. By the combination of four shades of blue and two shades of white, the horizon and sky is depicted through the length of the plane.